Wow, I don’t know how Brian and Galen are able to do this every night, even if it is just to comment on other’s postings! Anyway, it’s Stretch Tuesday again! BugDoc Dave here and the recent discussion by Barbara Harriman with Kitty and Russel Umbraco has given me the idea of covering the handled servers! This will likely take a couple of sessions, so be patient! Before I get to this topic, I wanted to comment on Barbara’s posting yesterday. 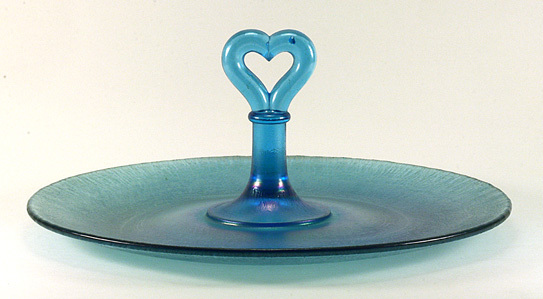 She showed a Northwood Topaz server that had excellent iridescence on the back side (which would have been the inside of a bowl-shaped form when it came out of the mold) and weak iridescence on the top side (which would be the outside of the bowl-shaped form)! In order for the bowl area to be flattened down into a plate, the piece would have to be greatly heated which can fire polish off the iridescence. I’ve noticed that several companies had this issue and some even went so far as to not even try to heavily iridize the top side of the server. This can produce a very interesting effect in that you only see the stretch iridescence through the glass. This can set up an internal reflectance that accentuates the overall iridescent effect! Bottom line, the top iridescence wasn’t rubbed off, but was most likely fired off during the finishing of the piece. 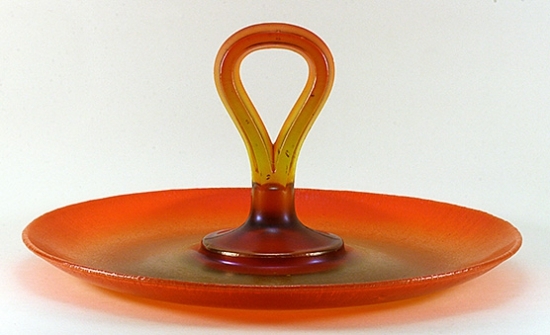 The loop-handled server by U.S. Glass has an opening in the handle that looks like a rounded triangle and the six-sided stem extends nearly to the base. This is one of the most commonly misidentified servers as folks simply don’t think of U.S. Glass. This server is most commonly found in Blue, Topaz, Crystal and marigold, but I have it in olive green, an aquamarine-style blue, and dark purple. The server is often outlined with a black or dark green enamel, and there are some with an over-all enamel decoration applied to the tray bottom. 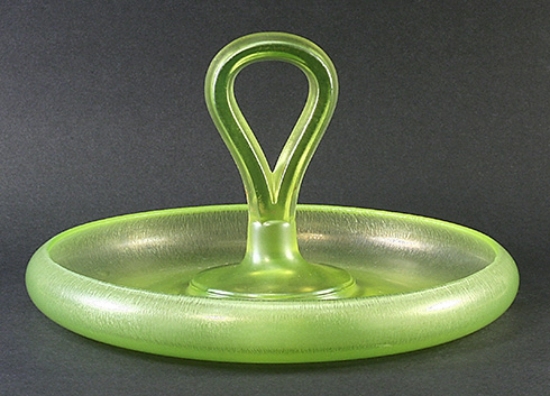 U.S. Glass also made a looped handle for their #310 line. This tray has the double-rows of rays on the tray undersurface and the handle loop is slightly pointed at the top. 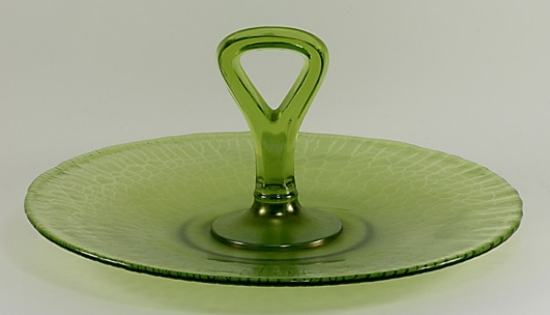 This tray only comes in green or pink. The heart-handled servers are easy. If the heart is small and the tray round, it’s Diamond’s production. 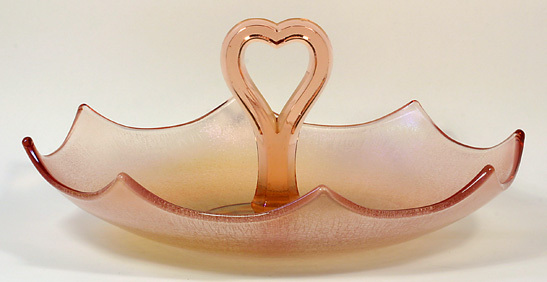 If the heart is large and the tray is octagonal in outline, the tray is Imperial’s. 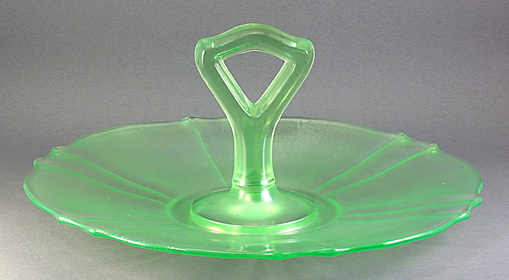 The Diamond trays are not easy to find and usually come in Green or Blue. The Imperial trays are usually crystal or pink. The Imperial trays can also be found in the sandwich (flattened) or fruit (cupped up) forms. The Imperial trays can also have decal or floral painted designs. 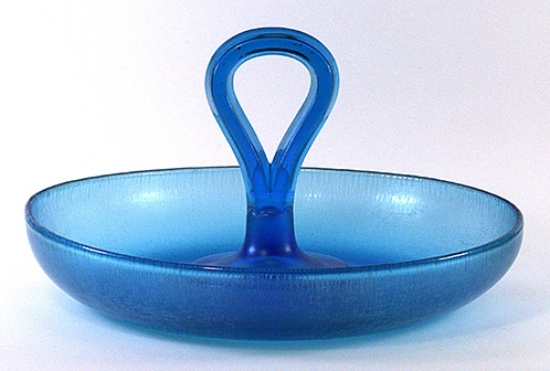 I have one tray that is a light, almost aquamarine, blue base glass.